Bowling Green Athletic Club is proud to have two locally owned and operating gyms since opening the doors in 2007. In addition to our main location on Scottsville Road we opened our second location on Flex Park Drive in 2011. We wouldn’t be anywhere without our wonderful members which is why it is our mission to see each of them reach their personal goals and consider BAC their resource for all their fitness needs. Our mission is to see our members reach their personal goals and consider BAC their resource for all their fitness needs. We do this by providing first-class comprehensive fitness services designed to enhance members’ health and well-being. BAC is focused on superior personal service and the attention to details, in the cleanliness of our facility and in customer service. 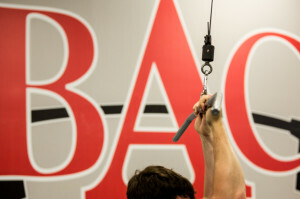 At BAC we are raising the bar; this pertains to setting higher expectations of quality and quantity. We trust in our staff that these expectations will be met above and beyond your standards. So set you expectations high, for yourself and the gym, and come join us today! BAC is proud to be a member’s first club where our guests can escape and enjoy their active lifestyles. Our friendly and energetic staff is happy to assist our members with questions or needs. At BAC, member service is our top priority.